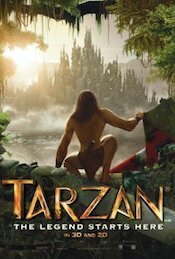 In this contemporized, German-produced 3D computer-animated interpretation of Edgar Rice Burroughs’ famous tale, Tarzan is the son of an industrialist who perishes in the African wilds while searching for an ancient meteorite that may offer a solution to the world’s energy crisis. Veteran composer David Newman – son of legendary composer Alfred Newman, brother of composer Thomas Newman and cousin to Oscar-winning songwriter/composer Randy Newman – here forges a pulsating, heroic orchestral score rich with African-inspired rhythms and sweeping, elegiac crescendos. A paean to the richness and resiliency of the human spirit as well as the sanctity of family, Newman’s score traffics in such refreshingly old-fashioned notions as romanticism and nobility, employing a wide range of thematic approaches – gentle (“Tarzan is Alive”), ebullient (“Growing Up”) and noble (“Reunion”) – to infuse the film with a gravitas typically reserved for live action efforts.